Duty Free Shopping in St. Thomas USVI, St. Thomas travel, St. Thomas vaction. - VisitStThomas.com In the US Virgin Islands. St. Thomas is America's Paradise in the Caribbean. Duty Free Shopping in St. Thomas USVI, St. Thomas travel, St Thomas vacation. - VisitStThomas.com In the US Virgin Islands. St Thomas is America's Paradise in the Caribbean. 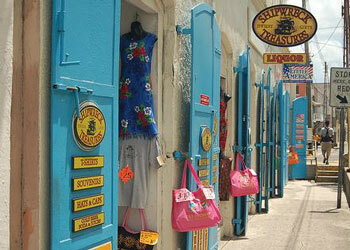 Did you know... Shopping in St. Thomas is a sight-seeing tour in itself! Quaint shops are tucked in historic buildings made of cut coral, molasses mortar, and Danish bricks brought as ballast on the trading ships of the 1700 and 1800s! Interesting shaded courtyards in these restored buildings house shopping arcades. Exploring is fun - there is treasure at every turn! Each U.S. resident, including children, can take home $1600 worth of duty free goods bought in the US Virgin Islands. When returning to the US you will be required to fill out a separate customs form for these items. You may be asked to show your receipts so it is important to keep a good record of what you buy. This duty-free allowance is double the $800 limit from other islands. You may also take 5 cartons of cigarettes and 5 litres of liquor back as long as one of the bottles is a product made in the Virgin Islands such as Cruzan Rum. Click below for the best Duty Free Shopping St. Thomas has to offer. Right on the Cruise Ship Dock, a convenient, less crowded way to go shopping for the duty free purchases that you may be looking for. All of the major retailers have well stocked stores with the same merchandise and prices as downtown. And if you make a purchase in a Havensight Merchants' Association Member store, your purchases will be 100% guaranteed! Look for the Association logo on the doors of the member merchants. Plenty of Parking! This may be one of the more famous shopping districts in the Caribbean. Main Street, starting off at Post Office Square, is lined on both sides of the streets with retailers of every type, all offering duty free bargains. Suggest parking in the Fort Parking lot. The newest addition to St Thomas' shopping districts has a nice assortment of retailers from jewelry stores to cameras and electronics, linens, local arts and crafts. Lots of parking. Check for hours by calling 774-2132.